The film adaptation of Maurice Sendak’s children’s story is a mature, enchanting ride. Courtesy aceshowbiz.com Where the Wild Things Are hit the box office with much fanfare, but the complex adaptation recieved mix reviews. 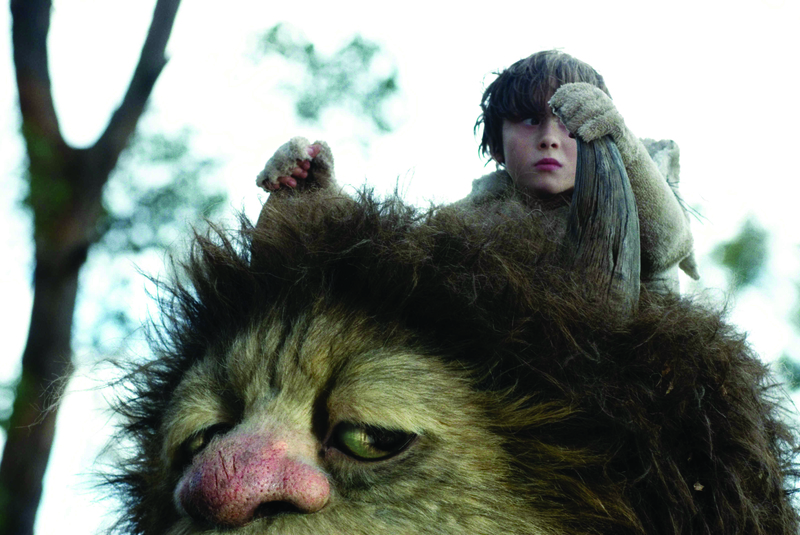 Spike Jonze’s film adaptation of Where the Wild Things Are is a triumph. From the simple melody hummed as the opening credits roll in to the buoyant chorus of Karen O’s (of the Yeah Yeah Yeahs) “All is Love” as the credits roll out, the film leaves audiences mystified. Based on the classic 1963 children’s novel by Maurice Sendak, the movie is much more mature than its 10-sentence inspiration. Though its story applies to all ages, the film is definitely geared toward an adult audience. And rightly so, for the highest demographic of people seeing this movie will most likely be parents who had this book read to them as children and are now reading it to their own. Jonze’s ability to express the core of the human spirit is extraordinary. He captivates his audience by holding a mirror up to them, forcing them to look inside themselves and dig deep down to their childhood emotions. The story focuses around Max (played by Max Records), a young boy who seeks adventure. At the beginning of the film, emotions run like a roller coaster, as Max starves for his mother’s (played by The 40-Year-Old Virgin’s Catherine Keener) attention, and when he does not receive it, he loses his temper and runs away from home in a fury. At this point, rage turns into fear, and the faraway land of the Wild Things becomes his newly imagined reality. The camerawork of Cinematographer Lance Acord is phenomenal, portraying a world often shot from a child’s perspective. Audiences are immersed in the movie, awakening all the senses. One could almost feel brisk breeze in their head, smell the fresh autumn afternoon and touch the worn bark of the forest. The late afternoon sun radiating on the fiery leaves as Max and the Wild Things stampede through the brush is almost realistic enough to make you forget you’re sitting in a theater and not running with them. The setting is timeless. Falling leaves are replaced by falling snowflakes; snowflakes are replaced by falling flower pedals that form a thin pink carpet on the forest floor. From treacherous oceans to glassy lakes, from rocky cliffs to rolling sand dunes, Where the Wild Things Are nearly gives audiences a free trip around the globe. Jonze reaches into the deepest psyches of the imagination to make the settings become symbols of emotion. Each monster is given a name – unlike the book – and is characterized as a personality trait. Each one’s size matches its simplified, larger-than-life behaviors. In many ways, each Wild Thing represents that stereotypical cliché on the playground. Alexander is the scrawny kid no one listens to, Carol is kid who’s friends with everyone and has trouble with changing friendships, and Judith is the bossy girl that secretly just wants to be included (think Angelica from the Rugrats). Like Max, each of them has his or her own emotional hardships. What one must remember is that this entire world is framed by his own mind. The simplicity of childhood emotions is what makes the movie so deep. The film displays mature themes of loss, isolation, insecurity, power and of course, growing up. Matt Flocco can be reached at matt.flocco@temple.edu. More than 10,000 illustrations from Maurice Sendak will be retracted from a local museum. With the recent movie release of Maurice Sendak’s children’s classic, the Rosenbach Museum explores the beginnings of a phenomenon.